Why Have a Professional Corporation (“PC”)? Physicians who carry on their medical practice in Ontario personally pay income tax at a rate in excess of 46%. Such physicians are not permitted to split income with family members, except to pay “reasonable salaries” to family members who provide actual services to the practice. Such salaries are frequently challenged by Canada Revenue Agency (“CRA”). By incorporating a PC to carry on the medical practice, a physician can achieve significant tax advantages by way of paying tax at a much lower corporate tax rate (16% rather than 46.4%) and income splitting with family members by paying dividends (which themselves are taxed at a lower rate)..
vi. The activities of the PC must be limited to carrying on a professional medical practice (and related matters and investments). With the recent changes that now allow share ownership of medical and dental professional corporations by family members, there is a renewed interest in professional corporations. It is a good time to review the rules and evaluate the costs and benefits of following this path. Generally shareholders of a corporation are not liable for the debts of the corporation; however shareholders of an Ontario PC will still be personally responsible for professional liability. Unlike the increasing popular Limited Liability Partnerships, each partner will be held jointly and severally liable with the PC for all professional liability claims made against the corporation in respect of errors and omissions that were made or occurred while he or she was a shareholder. The College of Physicians and Surgeons of Ontario has announced that the application fee for incorporation will be reduced from $750 to $350, effective for applications received after January 1, 2006. The application fee for dental professional corporations remains at $750. In addition to the set-up costs, the only costs associated with a PC are the annual administrative and accounting costs of maintaining the corporation. Generally these costs are not significant. The main advantages and reasons for establishing a PC are income tax related. However, although the physician remains personally liable for professional matters, the PC does offer some advantages of limited liability for non-professional matters, such as if the PC borrows money and enters into agreements, such as office lease and equipment leases. However, additional possible tax advantages, such as creating an individual pension plan, tax deferral (to next year) by bonus accruals, use of non-calendar year end, no HST payable on dividends and no requirement for dividend recipients to perfom reasonable (i.e. any) services. 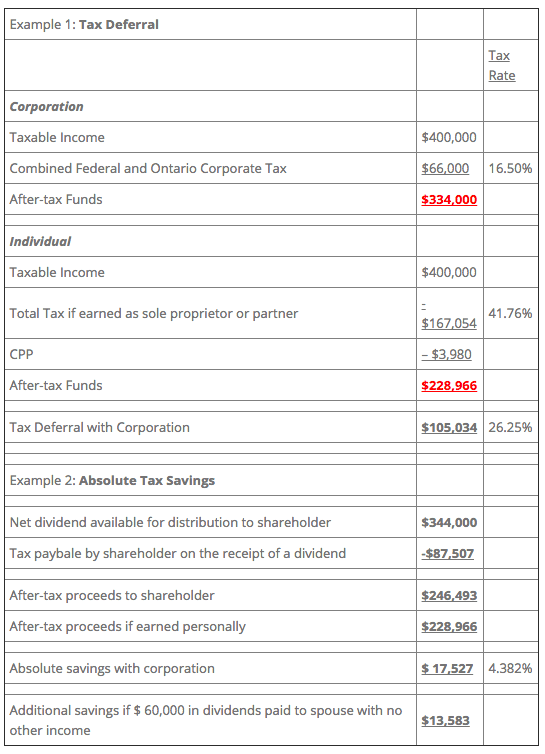 The tax rate paid by a corporation qualifying for the Small Business Deduction in Ontario is approximately 16% compared to the top marginal tax rate of 46%. Where the funds are needed by the professional for personal purposes or to fund the operations of the business, the professional will enjoy a substantial deferral of income tax. Further significant savings can be had if the doctor defers the withdrawal of the funds until retirement since it is likely that the doctor’s tax rate in retirement will be lower than the current tax rate. A corporation (including a PC) can earn up to $500,000 per year of active business income at the 16% tax rate. This provides a tax savings of approximately 30% compared to the personal tax rate in Ontario that applies if the physician earns the practice income personally (46.4%). This lower tax rate applies only to income left behind in the PC. The net after taxed income within the corporation will be paid out as a dividend, which will be taxed in the professional’s hands. In theory this second exposure to income tax should bring the total tax up to the total of 46.41%, or the amount that would have been paid had the professional earned the income directly; fortunately there is actually a savings of about 4% when earning your income through a corporation compared to earning it directly. Therefore, on income up to $ 400,000, the professional could save over $17,000 in income tax. In addition the professional will often accumulate the excess income in the corporation and then wind down the corporation in his or her retirement, withdrawing the retained earnings at a lower tax rate. Since the dental and medical professionals are allowed to issue shares to family members, they will be able to allocate dividend income to these other family members. The savings from income splitting can be significant. Should the income of the corporation be less than $ 400,000, there will be no need to pay a salary to the professional; therefore there will be no CPP contributions. This will save about $ 4,000 per year. The catch is that the physician may not have a full pension from CPP upon retirement. The physician can easily self-insure by investing the savings in a bank saving account or a Tax Free Savings account. The tax plan usually includes replacing salary with dividends; as a result the professional may not have any earned income, which in turn means that he or she will not have any RSP contribution room. With the ability to incorporate professional medical practices, this now provides the professional with the ability to sell his or her interest in the practice as shares, which means up to $ 750,000 of tax free income. For members of the medical professions, it may be possible to access more than $ 750,000 in tax free capital gains by having other family members own shares of their Professional Corporation. Where the practice has a significant value associated with the goodwill, it will be possible to sell the goodwill to the new corporation for yet another tax break. We would sell the goodwill to the new corporation at a price at or below fair market value. This would create a capital gain in the doctor’s hands. The top rate of tax on a capital gain is 23%. This would effectively reduce the physician’s rate of tax on what would have been a dividend from 31% to 23%. If the goodwill was worth $ 500,000, the approximate saving would be $ 40,000. A further benefit would be that the corporation would now have a depreciable asset. Goodwill purchased for $ 500,000 would produce a tax asset of $ 250,000 to be written off at a rate of 7% per year. If we assume a corporate tax rate of 16%, this will save the corporation another $ 40,000. This savings is spread out over many years, so the present value would be much lower. By having their spouse’s own non-voting shares of the corporation, we will now be able to utilize a fairly common interest write off plan. Effectively we want to be able to convert personal debt, on which the interest is non-deductible, to investment debt, on which you can get a write-off for the interest payments. On a $ 500,000 mortgage, where you are paying 5% interest, the savings could be as high as $12,000 in tax every year. » The additional after-tax income left in the PC allows the PC to pay off debts more quickly than if the income was earned personally by the physician and provides a tax efficient method to pay certain non-deductible expenses (life insurance premiums and some entertainment expenses).